Aberrant epigenetic control is a common phenomenon in tumour progression. The epigenetic modifications such as DNA methylation, histone modification and nucleosome remodelling are involved in the regulation of many biological processes, alteration in which can result into tumourogenesis. Histone acetylation is often associated with gene expression; however deacetylated histones generally results in gene suppression. This whole reversible process is mediated by Histone acetyltranferase and Histone deacetylases (HDACs) respectively. HDACs perform the deacetylation of histones in nucleosomes, which intervenes changes in chromatin remodelling, prompting regulation of gene expression. HDACs likewise direct the acetylation status of various other non-histone substrates that includes oncogenes and tumour silencing proteins. As HDAC inhibition induces various tumour cells to enter apoptosis and consequently cell cycle arrest therefore, a large number of HDAC inhibitors have been reported to develop as a new class of anti-cancer agents. Apart from the two existing FDA approved HDAC inhibitors- Varinostat and Depsipetide, recently a new drug Farydak has been approved by the FDA for the treatment of multiple myeloma which thus validated the use of HDAC inhibitors for the treatment of cancer. Also, several other HDAC inhibitors are undergoing clinical trials. Here, we have reviewed the current status of structure based computational studies that has helped to rationalize the successful identification of HDAC inhibitors. 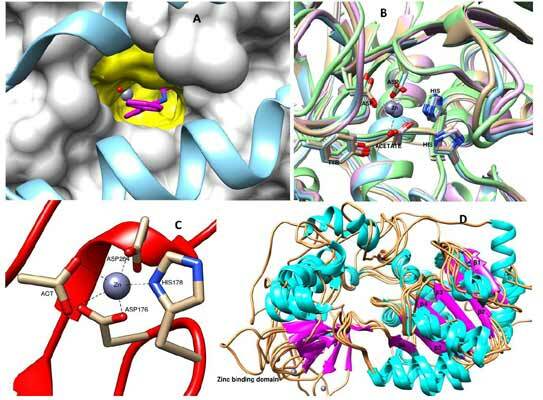 The objective of the present review is to provide an overview of contribution of structure-based computational studies that have helped in identifying HDAC inhibitors with an emphasis on the perspectives of its insight, current status, advances and future opportunities as well as the evolving efforts to characterize the structural dynamics of HDACs. Anticancer, Epigenetics, HDACs, Inhibitors, Molecular dynamics, Structure based virtual screening. Molecular and Structural Biology Division, CSIR-Central Drug Research Institute, Lucknow, India.